Costa Rica was sparsely inhabited by indigenous peoples before coming under Spanish rule in the 16th century. It remained a peripheral colony of the empire until independence as part of the First Mexican Empire, followed by membership in the United Provinces of Central America, from which it formally declared independence in 1847. Since then, Costa Rica has remained among the most stable, prosperous, and progressive nations in Latin America. Following the brief Costa Rican Civil War, it permanently abolished its army in 1949, becoming one of only a few sovereign nations without a standing army. The country has consistently performed favorably in the Human Development Index (HDI), placing 69th in the world as of 2015, among the highest of any Latin American nation. It has also been cited by the United Nations Development Programme (UNDP) as having attained much higher human development than other countries at the same income levels, with a better record on human development and inequality than the median of the region. In 2011, there were over 104,000 Native American or indigenous inhabitants, representing 2.4% of the population. Most of them live in secluded reservations, distributed among eight ethnic groups: Quitirrisí (in the Central Valley), Matambú or Chorotega (Guanacaste), Maleku (northern Alajuela), Bribri (southern Atlantic), Cabécar (Cordillera de Talamanca), Guaymí (southern Costa Rica, along the Panamá border), Boruca (southern Costa Rica) and Térraba (southern Costa Rica). ^ "Capital Facts for San José, Costa Rica". 18 October 2017. ^ "Costa Rica re-establishes ties with Cuba", CNN World, 18 March 2009. Costa Rica is administratively divided into seven provinces which are subdivided into 82 cantons, and these are further subdivided into districts. Cantons are the only administrative division in Costa Rica that possess local government in the form of municipalities. Each municipality has its own mayor and several representatives, all of them chosen via municipal elections every four years. The original 14 cantons were established in 1848, and the number has risen gradually by the division of existing cantons. Law no. 4366 of 19 August 1969, which outlines the creation of administrative divisions of Costa Rica, states that new cantons may only be created if they have at least one percent of the republic's total population, which was 4,301,712 as of the last census (2011). The last new canton, Río Cuarto, was created on March 30, 2017.The largest canton by population is the capital San José with a population of 288,054. The smallest canton by population is Turrubares with 5,512 residents. The largest canton by land area is San Carlos, which spans 3,347.98 km2 (1,292.66 sq mi), while the smallest is Flores at 6.96 km2 (2.69 sq mi). The Costa Rican Football Federation (Spanish: Federación Costarricense de Fútbol), commonly known as FEDEFUTBOL or FEDEFUT, is the official association football governing body in Costa Rica and is in charge of the Costa Rican national team. Costa Rica – United States relations have been historically close; nevertheless there were instances in history where the US and Costa Rica disagreed. One such example might be the case of Freebooter William Walker. Nevertheless, considering that Costa Rica generally supports the U.S. in international fora, especially in the areas of democracy and human rights, modern day relations are very strong. According to the 2012 U.S. Global Leadership Report, 41% of Costa Ricans approve of U.S. leadership, while 15% disapproving and 44% uncertain. with continuing growth in the GDP (Gross Domestic Product) and moderate inflation, though with a high unemployment rate: 8.2% in 2016. The economy emerged from recession in 1997 and has shown strong aggregate growth since then. The estimated GDP for 2017 is US$61.5 billion, up significantly from the US$52.6 billion in 2015 while the estimated 2017 per capita (purchasing power parity) is US$12,382.Inflation remained around 4% to 5% per annum for several years up to 2015 but then dropped to 0.7% in 2016; it was expected to rise to a still moderate 2.8% by the end of 2017 In 2017, Costa Rica has one of the highest standards of living in Central America in spite of the high poverty level, which dropped by 1.2% in 2017 to 20.5% thanks to reducing inflation and benefits offered by the government. The estimated unemployment level in 2017 is 8.1%, roughly the same as in 2016.The country has evolved from an economy that once depended solely on agriculture, to one that is more diverse, based on tourism, electronics and medical components exports, medical manufacturing and IT services. Corporate services for foreign companies employ some 3% of the workforce. Of the GDP, 5.5% is generated by agriculture, 18.6% by industry and 75.9% by services (2016). Agriculture employs 12.9% of the labor force, industry 18.57%, services 69.02% (2016) Many foreign companies operate in the various Free-trade zones. In 2015, exports totalled US$12.6 billion while imports totalled US$15 billion for a trade deficit of US$2.39 billion.The growing debt and budget deficit are the country's primary concerns. By August 2017, Costa Rica was having difficulty paying its obligations and the President promised dramatic changes to handle the "liquidity crisis". Other challenges facing Costa Rica in its attempts to increase the economy by foreign investment include a poor infrastructure and a need to improve public sector efficiency. The first natives in Costa Rica were hunters, and gatherers, and Costa Rica served as an intermediate region between Mesoamerican and Andean native cultures. In 1502, Christopher Columbus made landfall in Costa Rica. Soon after, his forces overcame the indigenous people. He incorporated the territory into the Captaincy General of Guatemala as a province of New Spain in 1524. For the next 300 years, Costa Rica was a colony of Spain. As a result, Costa Rica's culture has been greatly influenced by the culture of Spain. During this period, Costa Rica remained sparsely developed and impoverished. Following the Mexican War of Independence (1810–1821), Costa Rica became part of the independent Mexican Empire in 1821. Subsequently, Costa Rica was part of the Federal Republic of Central America in 1823, before gaining full independence in 1838. Its economy struggled due to lack of connections with European suppliers. 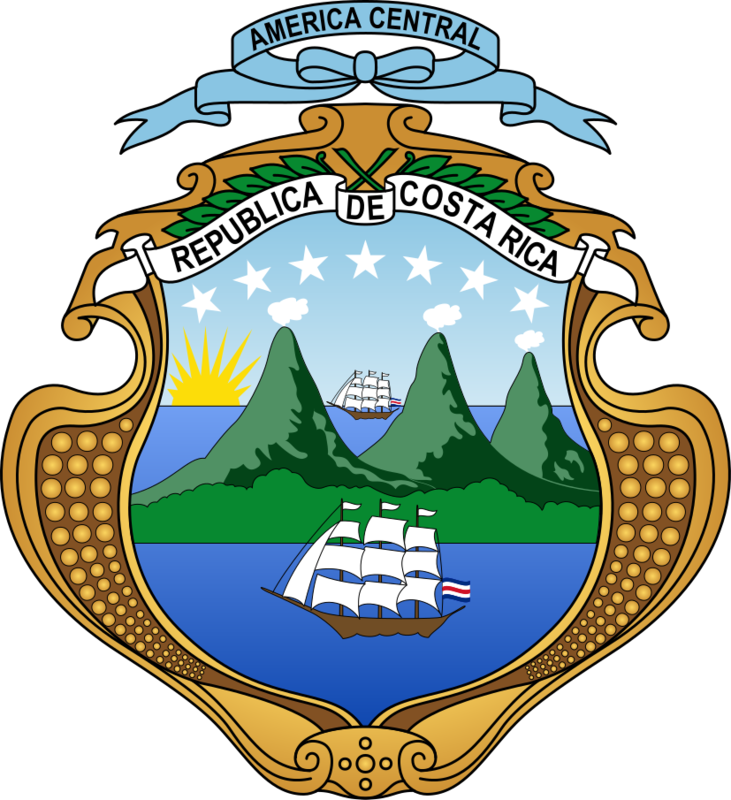 In 1856, Costa Rica resisted United States settlers from mounting a take-over of the government. After 1869, Costa Rica established a democratic government.After the Costa Rican Civil War in 1948, the government drafted a new constitution, guaranteeing universal suffrage and the dismantling of the military. Today, Costa Rica is a democracy that relies on technology and eco-tourism for its economy. Although poverty has declined since the turn of the 21st century, economic problems still exist. Costa Rica is facing problems of underemployment, foreign and internal debt, and a trade deficiency. The Legislative Assembly (Spanish: Asamblea Legislativa) is the unicameral legislative branch of the government of Costa Rica. The national congress building is located in the city capital, San José, specifically in El Carmen District in San José Canton. The Liga de Fútbol de Primera División, commonly known as Liga FPD, and Campeonato Banco Popular for sponsorship reasons, is the top professional association football division in Costa Rica. It is administered by the Unión de Clubes de Fútbol de la Primera División (UNAFUT). The league consists of 12 teams, with the last-placed team relegated to the Liga de Ascenso. The International Federation of Football History & Statistics (IFFHS) ranks the Liga FPD as the 51st strongest league in the world, and the 2nd strongest within CONCACAF, behind Mexico's Liga MX.The league was founded in 1921, with Herediano crowned as the first champions. Saprissa is the most successful club having won the championship a record 34 times. Saprissa, joined with Alajuelense (29 titles) and Herediano (26 titles) have dominated the league. This is a list of films produced in Costa Rica. The following article lists the junta chairmen, presidents and heads of state of Costa Rica since Central American independence from Spain. From 1824 to 1838 Costa Rica was a state within the Federal Republic of Central America; since then it has been an independent nation. This is a list of airlines currently operating in Costa Rica. The cantons of Costa Rica are subdivided into 473 districts (distritos), each of which has a distinct postal code.Postal codes in Costa Rica are 5 digit numeric, and were introduced in March 2007. The first digit denotes one of the seven provinces, the 2nd and 3rd refer to the 82 cantons (unique within the province), the 4th and 5th the 473 districts (unique within the canton). The numbers are the same as used by the Instituto Nacional de Estadística y Censos (INEC). The President of Costa Rica is the head of state and head of government of Costa Rica. The President is currently elected in direct elections for a period of four years, which is not immediately renewable. Two Vice presidents are elected in the same ticket with the president. The president appoints the Council of Ministers. Due to the abolition of the military of Costa Rica in 1948, the president is not a Commander-in-chief, unlike the norm in most other countries, although the Constitution does describe him as commander in chief of the civil defense public forces.From 1969 to 2005, the president was barred from seeking reelection. After the amendment banning reelection was overturned by the Supreme Court in 2005, an incumbent president became eligible to run again after waiting for at least eight years after leaving office. According to Article 168 of the Constitution of Costa Rica, the political divisions are officially classified into 3 tiers of sub-national entities. The Public Force of Costa Rica is the country’s law enforcement force, which performs policing and border patrol functions. San José’s municipal land area measures 44.2 square kilometers (17.2 square miles), and an estimated 333,980 residents in 2015. The metropolitan area stretches beyond the canton limits and has an estimated population of over 2 million in 2017. The city is named in honor of Joseph of Nazareth. Though few people live in the city center, it is the most important working area of the country, which brings in more than a million people daily. According to studies on Latin America, San José is one of the safest and least violent cities in the region. In 2006, the city was appointed Ibero-American Capital of Culture. Telecommunications in Costa Rica include radio, television, fixed and mobile telephones, and the Internet.